The range of AXIOMET power supplies available in TME has been extended by 4 additional models: AX-3005DBL, AX-3005DBL-3, AX-3020L, AX-3005DS. 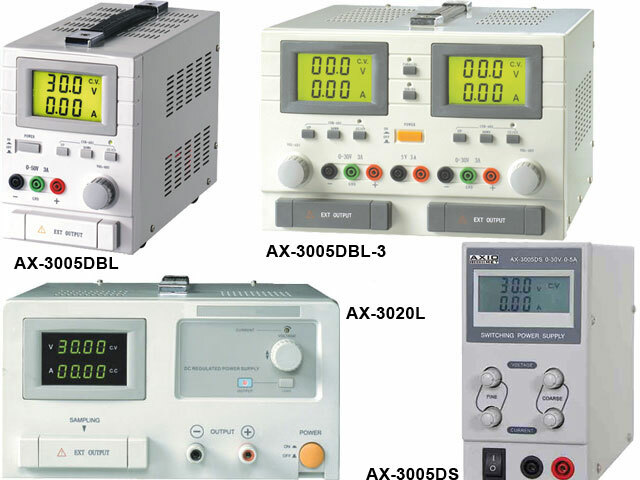 • AX-3005DBL is a single-channel laboratory power supply with voltage adjustment from 0 to 30V and current from 0 to 5A. A big LCD display allows simultaneous readout of the voltage and current with the resolution of 0,1V and 0,01A respectively. • AX-3005DBL-3 i s a two-channel version of the AX-3005DBL model with additional constant 5V, 3A output. The power supply is equipped with two highlighted displays, one per each controlled channel. The power supply is equipped with switches allowing to turn on serial or parallel operation mode. In case of direct current operation, after switching off power supply, the current value is stored in the EEPROM memory. • AX-3020L is a single-channel, high-power laboratory power supply with voltage and current adjustment within the following range: 0-30V and 0-20A. Legible LCD display shows voltage and current at the same time with the resolution of 0,01V and 0,01A. 4 mm banana sockets and additional screw terminals for fork terminals located under protective covers. • AX-3005DS is a single-channel power supply with adjustable output signal within the scope of 0-30V, 0-5A. Four handwheels allow for precise and rough adjustment of the output signal. LCD display shows at the same time the voltage with the resolution of 0,1V and current with the resolution of 0,01A.